If you're flying into Charles De Gaulle International Airport there are a few methods of transport into central Paris. Trains, buses, taxi cabs, and shuttles are standard options, and which you choose depends on how much you're looking to spend, and how fast you need to get there. Below is our quick guide on the different options including prices and hours of operation, so you can make the best choice to fit your budget and schedule. The RER is Paris’ suburban commuter train and your best option to get from Charles De Gaulle into Paris and even the outlying communities. 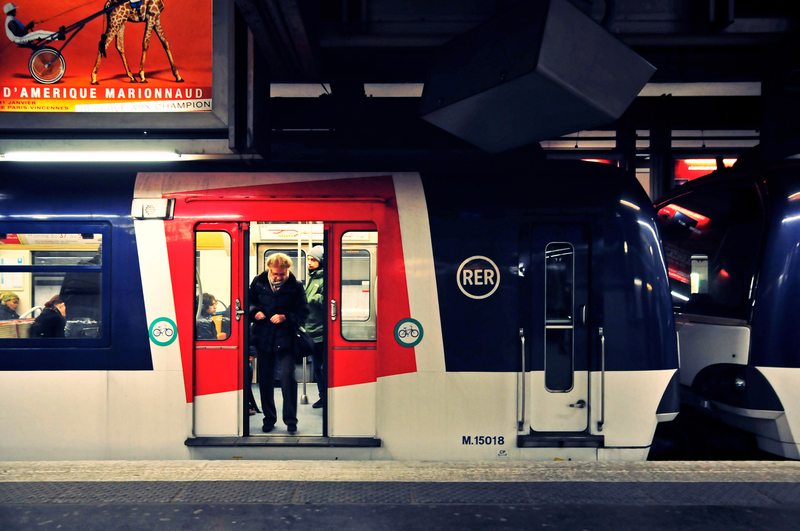 The RER B line runs from Terminal 2 to Gare du Nord station in central Paris in 30 minutes. Gare du Nord is a major transfer point in Paris, where you can connect to the city's subway (Metro), bus system, or to other suburban trains. Tickets for the RER can be purchased at the airport from the green Metro vending machines, and the ride costs €9,50. The first train departs at 4:56am from Charles De Gaulle, and the last one leaves at 11:56 pm. The Roissybus departs from terminals 1, 2, or 3 and terminates at the Paris Opera, in the city center. The cost is €10,00 and can be purchased from a vending machine in the glass enclosed stop at each of the terminals. The trip takes about 60 minutes, but can take longer depending on traffic. Departures are every 15 minutes from 6am - 8:45pm, and every 20-30 minutes from 8:45-11pm. The Noctilien is Paris' night-time public transit service, and operates from midnight to 6 am. The No. 140 and 143 both take you to Gare de l'Est, and you can catch them at in Terminal 1 at Gate 8, or the Roissypole bus terminal in Terminal 3. They take different routes but both end up at the same station. The 140 takes about 80-90 minutes, and the 143 takes about 55-60 minutes. Tickets are €7,60 and can be purchased onboard. If you have a 6 am flight and you don't want to pay for a taxi this is probably your best bet. Air France operates a shuttle bus called Les Cars from CDG to a few locations in Paris. Tickets can be purchased onboard the shuttle bus, or you can save €1,00 and buy your tickets online ahead of time. One-way the price is €16,10, round-trip €27,50. The shuttle departs about every 30 minutes, and the ride takes one hour depending on traffic, and how quick your other passengers settle in. If you're in terminal 1 you can catch the shuttle at exit 34. Terminal 2 you catch the shuttle at exit C2, B1 or exit 3. If you happen to be in terminal 3 you'll have to make your way to either terminal 1 or 2 to catch the shuttle. The No. 2 bus will get to Etoile/Champs Elysees (very close to the Arc De Triomphe)​ while the No. 3 will take you to the Montparnasse neighborhood. The No. 3 shuttle goes to Orly airport the local airport that connects Paris to local and other European destinations. Always our least favorite method, but if you are traveling with a lot of luggage might be a good option. The ride will take approximately 30-40 minutes depending on traffic, and you can catch a taxi in each terminal at the stands right outside. The flat rate into Paris is regulated by the state and should be between €50-60 with the rate increasing by 15% during the evening (7pm - 7am), Sundays and Holidays. However, some taxi drivers are liberal with their rates, so as always it's in your best interest to inquire​ as to what the flat rate is before you get in the taxi.